High-quality residential and commercial rectangular fire pit covers that perfectly fit your patio fire pit, backyard fire pit, indoor fire pit, outdoor fire pit, and poolside fire pit. Nothing beats having an outdoor lunch or dinner but the fire pit needs to be covered afterwards so that it does not get dirty. But keeping fire pit looking nice outdoors can be challenging. At ALCO, we’re up to the challenge with our outdoor rectangular fire pit covers that hold up to the elements all year long. 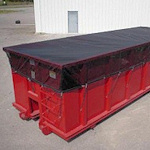 Unlike retail covers from big box stores, ALCO covers are heavy duty and made for “YEARS” of use! We have the warranty to stand behind that claim and you can’t get that warranty from a retailer. How many covers do you need? Accepted file types: pdf, doc, docx, xls, xlsx, csv, zip, jpg, jpeg, png, gif, tif, pptx, ppt. If you want to upload pictures of your furniture or additional information about it use this button. If we see any issues we will let you know. Print the portion of this page that has the image with the A,B,C..fields (Or take your smart phone with this page open). Go outside and measure your furniture with a tape measure. Then input the measurements into our form, select your features and place your order. Its that easy! Want Us to Send You A Custom Quote? If you have a more complex piece of furniture or you just want to see a quote before you order then use this simple form. 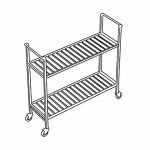 You can even send us a picture that you sketch on with dimensions and our experts will make sure its a perfect fit! 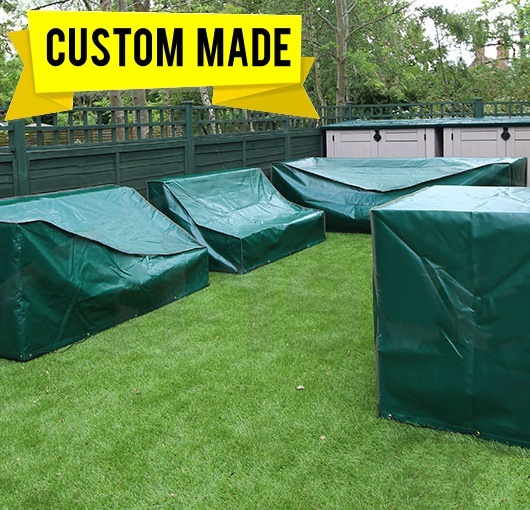 If you want to order a cover by giving us the dimensions of the cover rather than the furniture then build it online. Which material should I choose? If you are trying to choose between the 18oz and 12oz vinyl material please choose based on your environment. For regular weather conditions the 12oz vinyl is a great material at a slightly less expensive price. 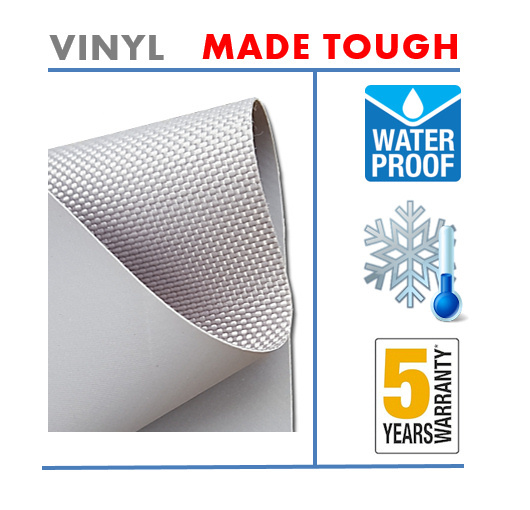 If you are going to experience heavy weather conditions such as heavy snow, heavy rain, and lots of wind then please choose the 18oz vinyl material. What is the texture like on the material? 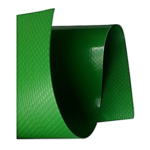 Vinyl material is not a fabric, rather it is a PVC material which is very slick. The video below can give you an idea of the appearance and how water just rolls off of the material. Our 18oz covers have a 5 year manufacturer's warranty and the 12oz has a 3 year manufacturer's warranty. 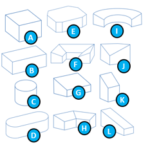 What is the most common material? 90% of the covers ALCO sells are made out of the 18oz Vinyl. While both materials are very strong and have the same appearance most customers choose the thicker material. Are they easy to clean? Yes. In fact vinyl is a material which is very slick making it easy to clean unlike other polyester covers which are similar to canvas. Canvas harbors mold and stains that are very hard to wipe off unlike the ALCO Vinyl custom furniture covers which are slick. 22oz vinyl is actually what is used on soft sided semi trailer trucks you see on the highway, so you know that it is an extremely durable and long-lasting material. We make our covers out of 12 and 18 oz vinyl, which is slightly thinner so that it is more flexible and not so stiff. Same material, just a thinner weight. Your backyard is an extension of your home, so naturally you want it to be as comfortable as the rest of the house is. Whether you already have a patio set that you love and you need to protect it, or you are planning to buy new patio furniture and want to keep it clean and usable for years to come, you need a high-quality cover for the table and chairs that help to create your home’s outdoor entertainment area. Big box stores and online retailers sell a one-size-fits-all furniture cover that most often times ship in from China. They generally look terrible once installed because you have to purchase a cover that is too large so that it fits. The problem is that it looks like a tarp has been thrown over your furniture. Another problem from purchasing a cover that is to large is that it results in water pooling up on the cover due to all the folds from that extra material. With ALCO, your covers are made right here in the United States and ALCO covers are made per the actual size you need! Its a better fit and a better appearance. If you own something that is valuable enough to cover, then cover it right! When buying custom furniture covers for your patio you want to be sure that it will keep your possessions safe, clean and dry. But did you know that when you sew, the holes the needle creates in the fabric can leave your cover susceptible to leaks. Big box stores don't tell you that their covers can leak at these stitching points in heavy rain. So at the seams you get drip marks on your furniture. That is why ALCO offers waterproof stitching sealing which covers the stitching on the inside of the cover so that rain and moisture can't get in and damage your furniture. Nearly every patio furniture cover on the market claims it is waterproof, but when put to the test, most people find that “waterproof” means it only stands up to a slight drizzle. When the rain really starts to fall, your furniture can get soaked. It is important that you pick a material that can withstand heavy rains. The best waterproofing is found in vinyl covers which ALCO specializes in. Vinyl allows water droplets to bead up and slide down the furniture cover before it has time to soak through due to the slick surface. Polyester blends are also common, but their waterproofing treatment can wear off or ends up becoming brittle and then cracking. This allows water that sits on the cover to drip through or the cover stays wet after it rains. The resulting exposure could mean you spend even more on a new cover or on replacing or fixing damaged furniture. Alco offers only high grade vinyl that holds up to the elements! Standard off the shelf covers often are lacking ties to secure the patio furniture cover. But what happens when the weather is accompanied by high or gusty winds? With no means of keeping the cover tied down or tightened at the base the cover could blow away. If you are not home at the time your cover and your cushions could be blow away and the furniture exposed to the elements. This could result in thousands of dollars in damage and the need to replace the furniture. For this reason, it’s important to ensure you purchase furniture covers that provide secure ties for each leg on every piece of furniture. If you are trying to decide between the 18oz and 12oz vinyl it might help to choose based on your environment. For regular weather conditions the 12oz vinyl is a great material at a slightly less expensive price. 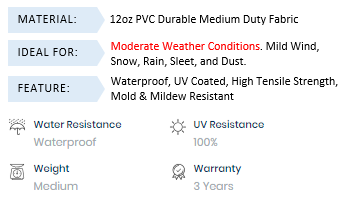 If you are going to experience heavy weather conditions such as heavy snow, heavy rain, and lots of wind then please choose the 18oz vinyl material. 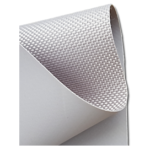 Vinyl material is not a fabric, rather it is a PVC material which is very slick. 22oz vinyl is actually what is used on soft sided semi trailer trucks you see on the highway, so you know that it is an extremely durable and long-lasting material. We make our covers out of 18 and 12 oz vinyl, which is slightly thinner so that it is more flexible and not so stiff. Same material, just a thinner weight. Our Vinyl covers have a five year manufacturer's warranty. 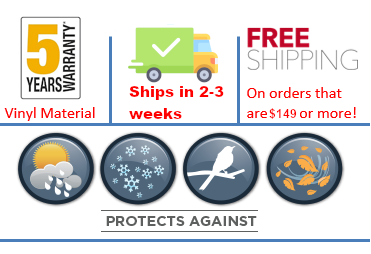 The custom made covers ship in only 5-7 work days from when you place your order. 90% of all the industrial covers ALCO provides are made out of the 18oz Vinyl. It is a material which is very slick making it easy to clean and its very strong. 22oz vinyl is actually what is used on soft sided semi trailer trucks you see on the highway, so you know that it is an extremely durable and long-lasting material. We make our covers out of 18 oz vinyl, which is slightly thinner so that it is more flexible and not so stiff. Same material, just a thinner weight. Can the covers be repaired if they get torn? Yes. If there is damage to your vinyl covers, then it can be repaired in the field using field patch tape. You can purchase the tape from ALCO and get your cover back in working order quickly. Very impressed with the quality of these, especially for the price. Buying custom fit many covers means they fit like a glove. They look nice, and feel well made. Even after a year these have worked really well for us. Even in a thunderstorm the cushions stay dry. Only during an extended rainy period did the top of the back cushions get wet where they were in contact with the cover which is understandable. Flipping the back cushion down prevents this. Covers themselves have continued to hold up nicely. I bought two of these chair covers - along with a settee cover and a table cover. All were of the same heavy durable material. We have used these covers only one season in Nevada’s mild weather, however that is enough for me to decide that we made a good call here. We have had our patio furniture for a good six or seven years, and have tried several different tactics to preserve our furniture over the winter months. These covers are by far and away the most convenient and most effective solution, well worth the price. These are REALLY nice covers. Very heavy fabric and they protect my furniture from the elements here in Florida. I bought chair, ottomans and love seat covers and all fit a great. I have wicker furniture with cushions on the seat and back. Fantastic product! In the past month we have been ravaged by pollen and storms. Based on our patio furniture, you would never know! The material is very durable and protects from water. It has the optional drawstring at the bottom so you can pull tight. This helped when we had strong winds. I'd highly recommend! I bought four of these for our patio chairs that have absolutely no protection besides these covers. The have exceeded my expectations in keeping the chairs dry even in storms with high wind. They are easy to put on and take off and they fit the chairs nicely. I recommend you actually measure your chairs (don’t “eyeball”) to get exactly the size you need. This morning my husband was removing them after an all night storm so we could have coffee on the patio.... and he said now these are great covers!!! Enough said!!!! We bought this set along with the couch and coffee table covers. They are a very high quality material and well-constructed. We were taking our cushions and pillows off daily and storing in the garage. NOW we just cover them. We have had 2 major wind and rain storms and they never moved or leaked. We don’t even have them attached to the furniture and they never moved. Our cushions are not only dry but clean too!! I would actually give this set a “10”. Well worth it! My husband said good job honey these are awesome. These covers are great. Nice and thick and very good quality. They've really helped protect the furniture on our screened in porch the past two summers and I'm so happy I no longer have to drag all the cushions into the house whenever it might rain. Also used them to protect the furniture during the winter and they worked very well for that too. They are nice and big and sturdy and stay put on the furniture, no matter how much wind there might be. The back wall of our kitchen is floor to ceiling windows looking out onto the screened porch and these look decent enough that we don't mind having to look at them when the furniture needs to be covered (unlike the tarp, etc we used to use at times!) We like them so much we've recommended them to friends and family. Just got delivered and was anxious to see how they looked and fit on our new chairs for around the pool, since we're supposed to get more rain next week. Very happy to say that they look fabulous and fit perfect plus the price was great and seem like excellent quality. So happy to not have to take all the pads off and haul under cover when it starts to rain. These are great. I have had them on for almost 5 months now. They are heavy. They come off and go back on easily. I have them under trees with no issues from staining or anything. I plan to order these when I need replacements for my other patio furniture. This is our 3rd set. We were getting cheaper ones but they kept getting holes after a heavy rain, this brand held up very well in a storm. Would buy again, if ever needed.